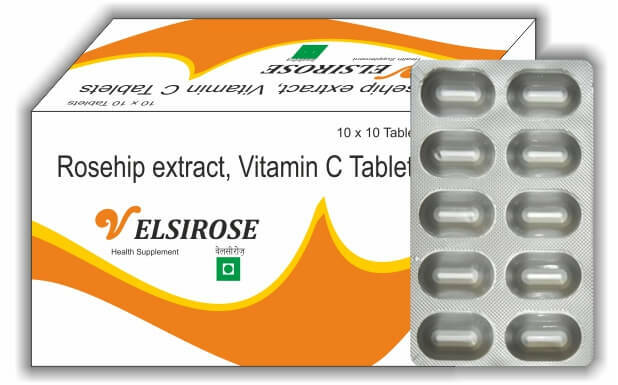 Vitamin C, combined with Rosehip, may be taken orally against many other problems commonly associated with vitamin C deficiency. Vitamin C with Rosehip, a rich source of this essential nutrient may be a great option for those looking to supplement their diet and meet their daily vitamin C nutrient needs. Arthritis is an inflammation in joints caused by breakdown of connective tissue collagen in the cartilage that serves as a cushion between the bones in joints. Low blood levels of vitamin C could increase the risk for developing arthritis. Rosehip powders may work with vitamin C supplements to reduce the symptoms of arthritis. Compounds in Rosehip called galactolipids may help for cartilage breakdown in joints. The benefits of Rosehip in arthritis may also be linked with antioxidant and anti-inflammatory effects of Rosehip flavonoids and polyphenols. Apart from a chock-full of vitamin C rose hip is contains vitamin P, K, E, B-vitamins and provitamin A. It's also a source of carotenoids (beta-carotene, lycopene and zeaxanthin), tannins, sugars, pectins, organic acids (citric acid and malic acid ), mineral salts and essential oils. Due to the presence of so many biologically active substances ( antioxidants, vitamins and polyphenols ) Rosehip fruits are recommended to support the immune system, colds, and the excessive fragility of blood vessels, gall and kidney stones. Those fruits are also recommended in inflammation of alimentary canal, diarrhea, stomach and duodenal ulcer, rheumatism and burns but also convalescents after illness and in states of general weakness and tiredness. Rosehip should be included in the diet plans of all athletes because it keeps joints healthy and flexible. Rosehip are the small fruits that appear on a rose plant after blossoming. They look similar to tiny pomegranates or tomatoes, growing at the tip of the stem, and are red or orange in color. The immune system can contribute to rheumatic diseases. An inflammatory cytokine called Interleukin 1-Beta (IL-1ß) causes cartilage cells to produce proteins that digest and break down joint tissue. In moderation, this process encourages cell turnover, but in excess, this process contributes to long-term joint tissue degradation, which is what causes joint problems. While Rosehip doesn't reduce IL-1ß levels in the blood, it interferes with its ability to activate catabolic proteins. Rosehip is also able to reduce chemotaxis, which is the transportation of immune cells into tissue. This serves as both an anti-inflammatory and immunosuppressive mechanism. Uses: Rosehip alleviates joint pain through its immunosuppressive effects. Vitamin C is an antioxidant that helps support the immune system and helps neutralize free radicals in the body. It is required in the synthesis of collagen in connective tissue, neurotransmitters, steroid hormones, carnitine, and conversion of cholesterol to bile acids and enhances iron bioavailability and for healthy skin. Ascorbic acid is a great antioxidant and helps protect the body against pollutants. Vitamin C is used as a nutritional supplement for its antiscorbutic properties. Use of rose hips for their vitamin C content, in supportive therapy for cases of this vitamin deficiency is rational. Because a significant amount of the natural vitamin C in rose hips may be destroyed during drying and processing, therefore, some form of vitamin C is added to them. Vitamin C's important functions is acting as an antioxidant, protecting LDL cholesterol from oxidative damage. When LDL is damaged, the cholesterol appears to lead to heart disease, but vitamin C acts as an important antioxidant protector of LDL. Vitamin C may also protect against heart disease by reducing the stiffness of arteries and the tendency of platelets to coagulate in the vein. The antioxidant properties also protect smokers from the harmful effects of free radicals. Rosehip and Vitamin C are LIKELY SAFE for adults when taken by mouth appropriately. If you are taking any prescribed medication or have any medical conditions always consult your doctor or pharmacist before taking this supplement. There is not enough reliable information about the safety of taking Rosehip if you are pregnant or breast feeding. Stay on the safe side and avoid using amounts larger than those found in food. Vitamin C is LIKELY SAFE for pregnant or breast-feeding women when taken by mouth in amounts not greater than 2000 mg daily for women over 19 years-old, and 1800 mg daily for women 14 to 18 years-old. Taking too much vitamin C during pregnancy can cause problems for the newborn baby. Vitamin C is POSSIBLY UNSAFE when taken by mouth in excessive amounts.